Enchantée is a glittering book of magic, Paris, and simmering tension. If you love historical fiction, this debut is not to be missed. When smallpox kills her parents, seventeen-year-old Camille Durbonne must find a way to provide for her frail sister while managing her volatile brother. Relying on petty magic–la magie ordinaire–Camille painstakingly transforms scraps of metal into money to buy the food and medicine they need. But when the coins won’t hold their shape and her brother disappears with the family’s savings, Camille must pursue a richer, more dangerous mark: the glittering court of Louis XVI and Marie Antoinette. With the dark magic she learned from her mother, Camille transforms herself into ‘the Baroness de la Fontaine’ and is swept up into life at the Palace of Versailles, where aristocrats both fear and hunger for la magie. Her resentment of the rich at odds with the allure of glamour and excess, Camille is astonished to find that her would-be suitor Lazare, a handsome young inventor whom she thought shared her dreams of liberty, is also living a double life. As the Baroness de la Fontaine, Camille gambles at cards and flirts, desperate to maintain her place at court and keep herself and her sister off the streets. But la magie has its costs. When a scheming courtier blackmails her and Lazare’s affections shift, Camille loses control of her secrets. Then revolution erupts, and she must choose–love or loyalty, democracy or aristocracy, reality or la magie–before Paris burns. 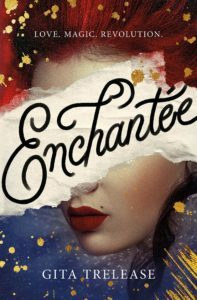 Enchantée is as magical on the inside as the cover. This is a story about family, about ambition, addiction, and magic. It’s about the family we love, but also hate. The push and pull of obligation, the ways they stretch us out further than we thought. But it’s also about struggle, addiction to the thrill, and figuring out where you belong. If you love historical fiction, magic, and complicated family, Enchantée is for you. (There’s also a side character who is Indian and French and his biracial background means that he doesn’t really fit in with the French aristocracy. He has a few conversations about his lack of choices and how he struggles being a Frenchman and Indian). The theme that emerged out of the darkness to absolutely enchant me was family. At the very beginning we witness the ways that family can hollow us out. We love them, but they also have this bewitching hold over us. When do we tell someone it’s enough? How much loyalty are they owed as their fates hover a knife’s breadth away from destruction? Camille carries a burden that endears herself to us. It’s a burden of family, the cages we walk into ourselves. What I loved about Camille is that she wants so dearly. So strongly. So fiercely. Whether it be to escape the cage of family, the suffering of magic, or to fly. I immediately felt a string connected Camille and I. The ways our dreams seem just out of reach, our fingers brushing their surface. While her brother’s gambling tears her family apart, Camille struggles with her own addiction. Something that becomes out of necessity, engages her in a dangerous game with stakes out of her imagination. The desire to have that transformation. From someone who imagines acting, to someone who acts, who turns possibilities into realities. And in many ways, her life begins to veer out of control. It’s like one of those con artists who have so many faces, they forget which one is the real one, the one that comes out of the darkness at night. Camille is driven by her desire not only to survive, but to live. To experience, to love, to have things within her grasp. And who can blame her? We all want to believe that there’s more out there. That our life holds more chances. But everything comes at a price, and Camille becomes entrenched in a game she might not be able to win. Can she win with the odds stacked against her? Or will the endless pursuit destroy her in the end? Like a moth to a flame, when is enough truly enough? A world where magic doesn’t have a cost, has never made sense to me. So in Enchantée magic has a price, and it’s steep. Whether it be sorrow, ambition, magic demands something of the user. And not only do we have this amazing plot of Camille, her family, and her own ambition, but it’s also grounded in historical fiction. The setting is a simmering pot waiting to boil. And as Paris begins to froth over, you can feel the foreboding, the danger, in the air. Paris comes alive like a fire cracker of possibility and danger in a moment of history standing on the precipice. I can’t sing the praises of Enchantée highly enough. There’s so much more underneath the surface, revolution, family secrets, scientific advancements, and more. Enchantée is a book about choices and about becoming the person you want to be. If you love a book about family, ambition, magic, all set in a glittering setting of Paris, pre-order Enchantée. Find Enchantée on Goodreads, Amazon, Indiebound & The Book Depository. What is your favorite cover for a 2019 release?